Smart elevator automation system is a new generation of elevators equipped with innovative technologies offering various facilities along with security. Smart elevator automation system is designed to minimize the overall energy consumption and manage passenger traffic efficiently within a building. With the advancement and innovation of technology and changing building infrastructure, smart elevator automation system has proved to be versatile to securely manage building traffic. In this report, FMI has segmented the global smart elevator automation system market on the basis of service, component, end users, and region. By service, the smart elevator automation system market is further segmented into installation service, repair & maintenance service and modernization service. On the basis of component, the smart elevator automation system market is further segmented into card reader, biometric, touch screen and keypad, security and control system, sensors, motors and automation system and building management system. By end users, the smart elevator automation system is further segmented into residential sector, commercial sector, hotels, and others. The modernization sub-segment is expected to grow at a relatively high CAGR during the forecast period in the global smart elevator automation system market owing to replacement of ageing components in conventional elevators with advanced components and technology. Moreover, in terms of value, the modernization services sub-segment is expected to represent an absolute $ value opportunity of US$ 9,922.3 Mn in the global smart elevator automation system market between 2017 and 2027. However, the installation services sub-segment is expected to capture a large share in the smart elevator automation system market due to the rise in construction of high-rise buildings. Apart from this, the rapid infrastructure development and increasing smart city projects in Asia Pacific Exc. Japan, and North America is one of the prime factors attracting the demand for smart elevator automation system. Deployment of smart elevator automation systems is increasing in existing elevators of the residential sector, especially in Asia Pacific, Western Europe and Latin America. This is attributed to construction of new high-rise buildings to accommodate the rising urban populace. Also, the demand for smart elevator automation system is increasing in countries in Asia Pacific such India and China as these countries are witnessing ever increasing growth in smart infrastructure development, urbanization, and energy-efficient elevators. These factors are expected to contribute to the growth of the smart elevator automation system market. Deployment of smart elevator automation system is increasing in high-rise residential and corporate buildings across the globe, owing to their features and benefits that enhance passenger experience, i.e., increased customizability and minimum waiting time. Moreover, rising energy costs and environmental awareness across the globe are driving the demand for smart elevator automation systems. Also, the rising concern for safety and security of buildings is propelling the demand for smart elevator automation systems worldwide. Furthermore, deployment of security and control systems such as fire alarm, intrusion alarm systems and surveillance systems is also driving the adoption of smart elevator automation systems. The rising demand for touchscreen displays and keypads is creating potential growth opportunities for the smart elevator automation system market. Also, the increasing need for refining interaction between passengers and elevators is fuelling the growth of smart elevator automation system market. Also, the increasing demand for smart elevator automation system in commercial buildings is creating potential growth opportunities for the smart elevator automation system market. Government regulations & standards for global green infrastructure, reduction in the operational cost and automation are playing a vital role in the growing adoption of smart elevator automation system across the globe. High initial investment for installation of smart elevator is one of the major factors expected to hamper the growth of the global smart elevator automation system market. Moreover, lack of awareness across commercial and residential sectors in developing and underdeveloped countries regarding smart elevators and smart elevator automation system, which can be deployed to reduce travel time and enhance passenger experience, is also expected to restrain the growth of the global smart elevator automation system market. The global smart elevator automation system market has been segmented into seven major regions, namely North America, Latin America, Eastern Europe, Western Europe, Asia Pacific Excluding Japan (APEJ), Japan and the Middle East & Africa (MEA). In terms of value, the Asia Pacific Exc. Japan Smart elevator automation system market is estimated to expand at a CAGR of 18.6% over the forecast period. This can be attributed to transformation of existing infrastructure and economic transformation & support from the government. In North America, the U.S. is projected to maintain its dominance in terms of total revenue generation in the smart elevator automation system market. In Western Europe, Germany is expected to be the dominant market for smart elevator automation system and is expected to create incremental opportunity of US$ 2,042.8 Mn between 2017 and 2027. The growing demand for enhanced safety and security systems is one of the major factors expected to fuel the growth of the smart elevator automation system in Western Europe. Examples of some of the key participants covered in the report include Fujitec, Mitsubishi, Hitachi, Kone Corporation, Otis Elevator, Schindler, ThyssenKrupp Elevator, Tyco International, and Honeywell. In 2015, Xizi Otis Elevator Co., Ltd., a subsidiary of Otis Elevator Company, China, announced to install 180 units of Gen2MR elevators across the nine ongoing housing projects in Mudanjiang, North China, in order to support urbanization. In 2015, Tyco introduced Tyco On, an integrated data and smart services platform. This platform possesses a wide range of software-enabled Internet of Things (IOT) capabilities needed to enhance safety and security of smart elevator automation systems. In 2014, KONE acquired Express Elevators Ltd. (Express), a U.K.-based company that specialises in installation, maintenance, repair and modernisation of smart elevator automation system. In 2014, Honeywell International Inc. launched Honeywell IS-4500, a TCP/IP-based Video Door Phone system that helps end users in ensuring visitor management, property protection, and elevator control. The report also describes company-specific strategies, key differentiators, market structure and competitive share analysis related to the prominent industry stakeholders. Future Market Insights offers a 10-year forecast for the global smart elevator automation system market between 2017 and 2027. In terms of value, the smart elevator automation system market is expected to register a double-digit CAGR during the forecast period. This study demonstrates the dynamics of the smart elevator automation system market and trends globally across seven regions, namely North America, Latin America, Eastern Europe, Western Europe, Asia Pacific Excluding Japan (APEJ), Japan and the Middle East & Africa (MEA), which influence the current nature and future status of the smart elevator automation system market over the forecast period. The report provides a detailed analysis of the smart elevator automation system market and offers insights about various factors driving the popularity of the smart elevator automation system and its advantages. The report includes an extensive analysis of the key industry drivers, challenges, market trends and market structure. The study provides a comprehensive assessment of stakeholder strategies and imperatives for succeeding in the business of the smart elevator automation system market. The report segregates the market based on service, component, end users, and regions globally. The smart elevator automation system market is expected to witness significant value growth during the forecast period owing to the advancement and innovation of technology and changing building infrastructure. The report starts with an overview of the smart elevator automation system market in terms of value and volume. In addition, this section includes an analysis of the key trends, drivers and challenges from the supply, demand and economy side, which are influencing the smart elevator automation system market. By service, the smart elevator automation system market is further segmented into installation service, repair & maintenance service, and modernization service. On the basis of component, the smart elevator automation system market is further segmented into card reader, biometric, touch screen and keypad, security and control system, sensors, motors and automation system, and building management system. By end users, the smart elevator automation system is further segmented into residential sector, commercial sector, hotels, and others. In terms of value, the modernization services sub-segment is expected to represent an absolute $ value opportunity of US$ 9,922.3 Mn for the overall smart elevator automation system market between 2017 and 2027. However, the installation services sub-segment is expected to capture a large share in the smart elevator automation system market due to the significant rise in construction of high-rise buildings. The next section comprises a detailed analysis of the smart elevator automation system market across various countries in the region. It provides a market outlook for 2017–2027 and sets the forecast within the context of the smart elevator automation system market, which includes latest technological developments as well as offerings in the smart elevator automation system market. This study discusses the key trends within countries contributing to the growth of the market, as well as analyses the degrees at which drivers are influencing this market in each region. The key regions and countries assessed in this report include North America (U.S., Canada), Latin America (Brazil, Mexico, Argentina & Rest of Latin America), Western Europe (EU-5 Countries, BENELUX, NORDIC and Rest of Western Europe), Eastern Europe (Russia, Poland, Rest of Eastern Europe), Japan, APEJ (China, India, ASEAN Countries, Australia & New Zealand, and Rest of APEJ), and Middle East & Africa (GCC Countries, South Africa, Israel, Turkey, Iran, Rest of MEA). The report evaluates the present scenario and the growth prospects of the smart elevator automation system market across various regions globally for the period 2017 – 2027. We have considered 2016 as the base year and provided data for the remaining 12 months. To offer an accurate forecast, we started by sizing the current market, which forms the basis of how the smart elevator automation system market will grow in the future. Given the characteristics of the market, we have triangulated the outcome of different types of analysis based on technology trends. 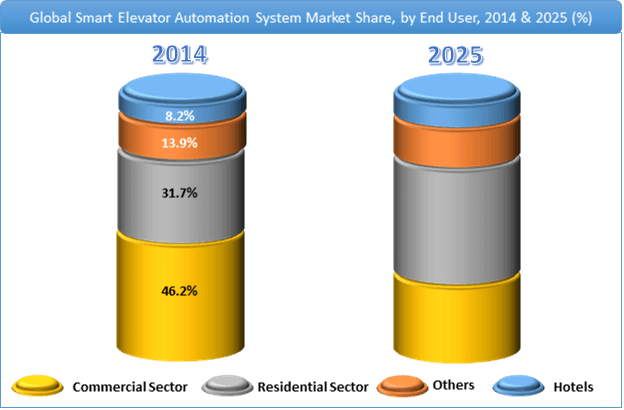 As previously highlighted, the global smart elevator automation system market is split into a number of segments. All the segments in terms of service, component, end user, and regions are analysed in terms of basis points to understand the relative contributions of individual segments to market growth. This detailed level of information is important for the identification of various key trends in the global smart elevator automation system market. In addition, another key feature of this report of smart elevator automation system market is the analysis of all key segments in terms of absolute dollar opportunity. This is traditionally overlooked while forecasting the market. However, absolute dollar opportunity is critical in assessing the level of opportunity that a provider can look to achieve, as well as to identify potential resources from a sales and delivery perspective in the global smart elevator automation system market. 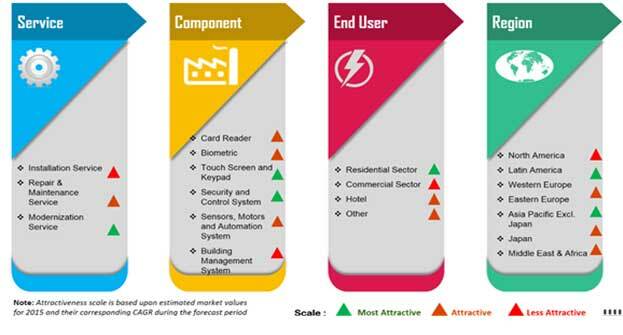 In the final section of the report, we have included a competitive landscape to provide clients a dashboard view based on categories of providers in the value chain, their presence in the smart elevator automation system market and the key differentiators. This section is primarily designed to provide clients an objective and detailed comparative assessment of the key providers specific to a market segment in the smart elevator automation system supply chain and the potential players for the same. Report audiences can gain segment-specific vendor insights to identify and evaluate key competitors based on the in-depth assessment of capabilities and success in the marketplace. Detailed profiles of providers are also included in the scope of the report to evaluate their long- and short-term strategies, key offerings and recent developments in the smart elevator automation system market. Examples of some of the key competitors covered in the report are Fujitec, Mitsubishi, Hitachi, Kone Corporation, Otis Elevator, Schindler, ThyssenKrupp Elevator, Tyco International, and Honeywell.